Highly respected B2B sales thought leaders and bloggers occasionally manufacture a debate that shouldn’t be played out. Admittedly the tendency is to put the strategies in different camps and posture as one against the other. The reality is that a modern B2B sales and marketing organization needs to have an inbound marketing strategy and most likely an outbound sales organization. The right balance must be struck. Inbound can drive the top end of the funnel and bring buyers with intent. Buyers can explore company solutions and review valuable content to navigate the decision process. 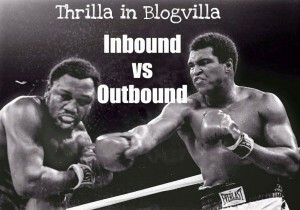 But inbound rarely drives all the lead volume to meet revenue objectives in a B2B enterprise. Outbound sales plays a key role. With both strategies in play inbound content can be integrated into the modern sales process and support the buyer’s journey from prospect to delighted customer. In a guest blog post titled: My Apologies to Inbound Marketers, I explore this topic in detail. You can find it here. I agree that a combination of the two is really the sweet spot. That being said, I think there is a way to use more of an inbound approach with traditional outbound sales techniques. *Not sure why everything is showing up in caps. Next post: Outbound Sales is Dead, Right?